When it comes to retargeting for SMEs (website visitors), many business owners know that the tools are available, but they are reluctant to invest more money in order to chase a client that didn't convert the first time around? We've heard this from hundreds of business owners who first want to see results before they continue investing. If that sounds like you, then consider that according to estimates, visitors to sites that use retargeting are at least 200% more likely to convert. This makes retargeting a critical element in the marketing mix for SMEs. What is Retargeting for SMEs? Retargeting means serving reminder ads to users who have visited your site in the past. Google's display network allows you to place ads on 92% of all sites on the internet. It even lets you alter your Google Ads (formerly Adwords) to increase bids for past visitors. The potential is huge. Contrary to what we might think, we're not always rational beings. Our decisions are often heavily influenced by our emotions. From a business perspective, one of the most powerful emotions is familiarity. Small brands can 'hack' this feeling of familiarity using retargeting. In traditional advertising, this is known as 'brand recall'; the more you are seen, the more comfortable users becomes with the idea of buying your brand. Interestingly, your brain doesn't necessarily process retargeting ads on a conscious level, but it does take place, and we have the stats to prove it. The more exposure you get to a brand, the more likely you are to buy from them. When analysing returning website visitors, you see a steep increase in conversion rate. This is the law of familiarity at play. On average 95% - 99% of customers will not enquire on their first visit. If you can lure them back to the site, the likelihood of conversion more than doubles. The data is very clear, 90% of companies are leaving money on the table. They are working hard to attract consumer attention once, and then failing to close the sale. This makes sense when you think about it in real-world terms. The average sales person has to followup seven times to close a sale - why would it be different online? 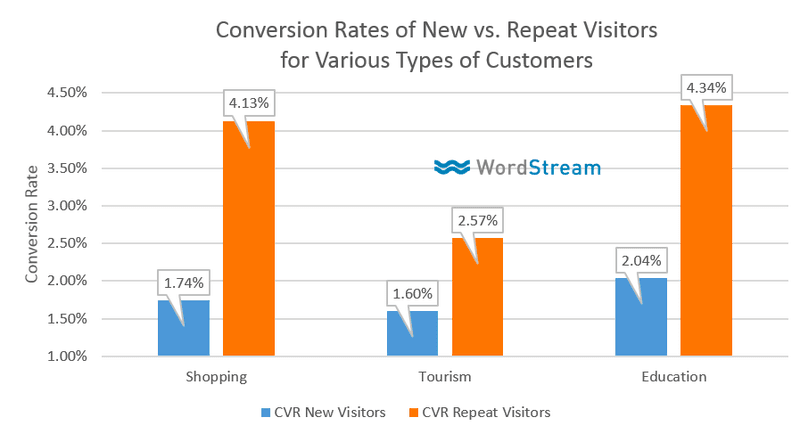 In the chart from WordStream below, we see just how powerful return visitation can be. Conversion rates of return website customers more than double. This supports the notion that money spent chasing past site visitors is money well spent, and forms essential part of your marketing mix. Retargeting is not just available for website visitors. If you have a list of past enquiries or customers, you can upload these to your retargeting platform and let the network determine whether it can locate those users. More often than not, past lead lists can rewarding for re-marketing, particularly when you know these people have a direct interest in your product. Which Networks Should I Use? There are a plethora of re-marketing networks to choose from. We recommend running your retargeting through a mix of Google & Facebook. Through these channels, you can reach around 84% of the people you tag, 10 to 18 times per month. What Sort of Retargeting Work? The truth is, a mixture of retargeting is going to work best. For those running Google Ads, it's assumed that you should retarget your past website visitors heavily in search results. Consumers often get lost in the buying process, so making sure your ads appear at the top of the page, will give you the best chance to get them back when they are ready to purchase. Pre-roll video ads are also great, however, many SMEs may struggle with the budget required to do these well. Retargeting is a balancing act, and you shouldn't advertise to people forever. It's important to understand how long your customer decision cycle lasts. Beyond this point, you'll see diminishing returns on your investment. We recommend setting up staggered retargeting, measuring effectiveness across 0 to 14 days, 14 to 30 days, 30 to 60 days. Over time, if the longer period tags underperform, you can reallocate your spend where it's working best. Ad Agencies love to sell high priced animated banners. They'll talk about 'taking customers on a journey' and other nice story. However, the truth is that animated banners tend to have lower click-through rates (CTR) and conversion rates across almost all platforms. The only place where this is consistently different is video, which doesn't count as banner ads. These two points are critical to understand. Customers aren't browsing the web and thinking about you. Hence a multi-stage HTML5 banner ad isn't going to be a great narrative. Consumers are going to glance at it, be confused by whatever scene they see, and then look away. It's a missed opportunity. Just like how moving hero images decrease conversion rate, moving banner ads do the same. AdEspresso ran an interesting test on Facebook. They ran an experiment where they pitted static banners versus animated banners. The final result of the experiment showed that static ads generate a staggering 38.2% lower CPA. That's right, they cost less to generate and performed better. We've made the whole process pretty straight-froward. While we could have talked about lead magnets, deep content, or any number of technical tactics, the truth is that first you need to understand the core concept. Re-marketing in any form will increase your conversion rate. Keep your message simple, and retarget those you know are already in market. Then simply track the results and build out your campaign from there!